Successfully Added Bark Prevention Collar - Water Resistant Barkstop Collar to your Shopping Cart. New high tech bark prevention collar that uses ultrasonic sound technology to help your dog learn to control his/her barking without causing any physical harm. This collar is a very effective behavior modification device to help train your dog to reduce / stop nuisance barking. Triggered by your dog's bark vibration, you can set the collar to emit either an ultrasonic only or ultrasonic + audible sound. 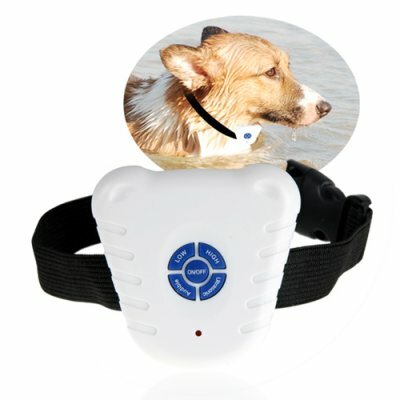 Your dog will quickly learn to associate barking with the ultrasonic beep of the collar. This is an effective training device to control your dogs excessive barking in a non harmful way (unlike some other bark control products on the market). Built to last, the fully weather resistant collar design can withstand tough daily abuse and fits comfortably around the neck of your favorite furry companion. It is water resistant and can be used for both urban home dogs as well as outdoor sport dogs. A great wholesale price makes this Water Resistant Bark Stop Collar perfect either for the re-sale market, OEM market, or personal use. As always, it is only available direct to you from the original source for wholesale direct from China electronic products, Chinavasion. The dog bark stop collar is a humane, safe and effective device for training your dog. Effective for stopping nuisance barking, but still allows dog to bark when true danger is present - burglar, bad guy, etc. Adjustable strap fits most necks and it is ergonomically designed so it will not cause discomfort to your dog. Worlds first fully weather resistant bark control product of 2009! Does your dog bark at the wrong times? Are you sick of the neighbors complaining? Can't get any quiet time on your day off? Can't train your dog not to bark? SOLUTION: CVFW-G13 Bark Prevention Training Collar! I mounted it today to my dog`s neck and from then I`m still waiting to hear it barking. Looking forward to see what will happen tonight.